The memorial opened to the public on April 29, 2004 and was dedicated one month later on May 29. It is located on 17th Street, between Constitution and Independence Avenues, and is flanked by the Washington Monument to the east and the Lincoln Memorial to the west. 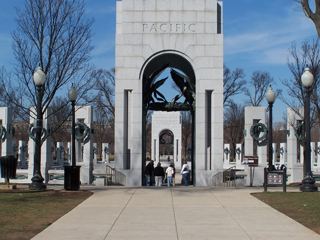 The memorial is operated by the National Park Service and is open to visitors 24 hours a day, seven days a week.